Sleep-starved from a repeating nightmare and weary from wondering when all that therapy would reignite his fading hope, former Army tank gunner Jeff Barillaro took aim at his stubborn target with an attack as brilliant as it was simple. He decided to break up with PTSD. 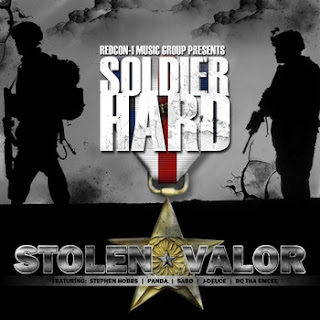 And he would do it in his increasingly famous style — studio-recorded hip-hop, under his stage name, Soldier Hard. “I thought: If I could write a letter to PTSD, what would I say to PTSD? Then I thought: Oh, wow, this is going to be powerful,” said Barillaro, an Iraq War veteran, out of the service since 2010, who has steadily gained fame among active-duty troops, young veterans and their families for his bare, often-bleak music about the daily demons of living with severe Post Traumatic Stress Disorder. The label not only produces the work of other talented veterans, it provides workshops and other events to veterans and their families. Quoting Ron Borczon, a professor of music at California State University at Northridge who specializes in music therapy, “Through the musical experience, they find hope that they can get better.” He points out that the act of performing and listening to music lowers stress levels and reduces heart rate and blood pressure. This entry was posted in Uncategorized on March 22, 2013 by stevesparks.